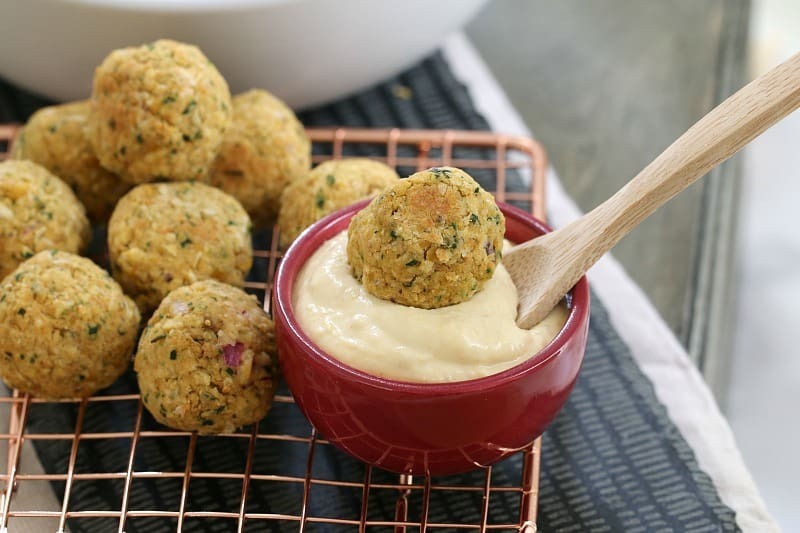 Deliciously healthy oven baked falafel balls made from chickpeas and baked to perfection. Serve with hummus and quinoa salad for a yummy and nutritious family meal! 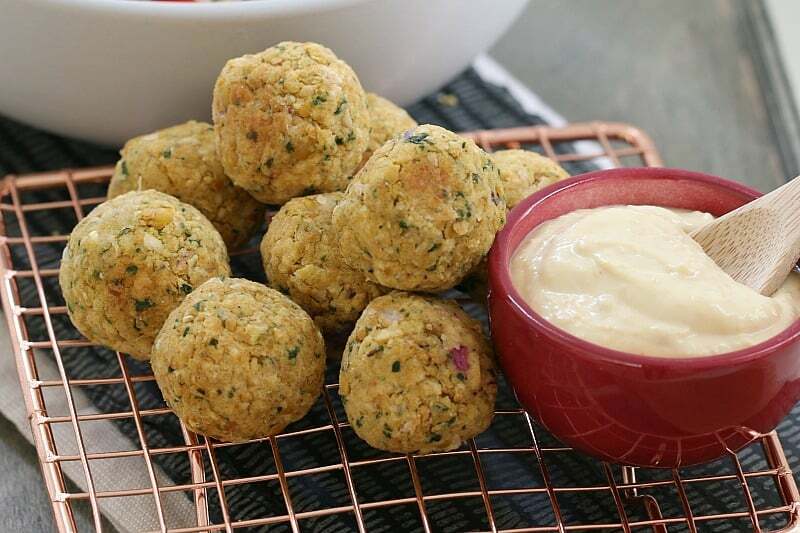 So let me tell you about these Healthy Oven Baked Falafel Balls. First of all… OMG they’re ridiculously yum. Second of all, they’re healthy (yay!). And third of all, they’re baked in the oven so there’s no greasy-yuck oily-ness going on. Nope, just crispy, oven baked deliciousness. 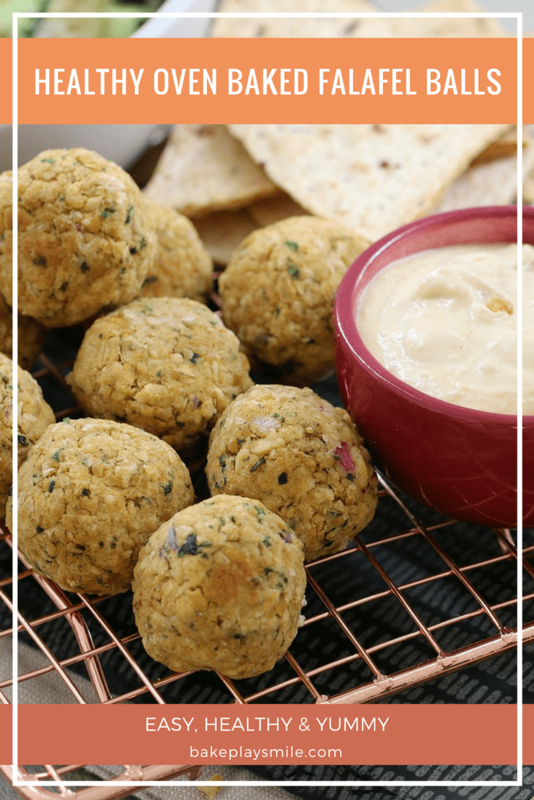 I’ve been making these falafel balls for years, but I thought it was about time I made a batch for Will to try. And trust me, they were a total hit with him too. They’re just the right finger-food size for bubs and toddlers and they make a great addition to any lunchbox. And because they’re freezer-friendly, you can cook them ahead of time and then grab them straight out of the freezer on the day that you need them. They can be served warm or cold… with a salad… in a wrap… on their own… however you like! I must say though that my very favourite way to serve them is with my healthy quinoa salad and a big scoop of hummus. Yummity, yum, yum, YUM! 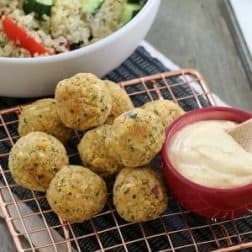 Ooh and these Healthy Oven Baked Falafel Balls are also a great option for vegetarians, as well as anyone needing a dairy-free option. 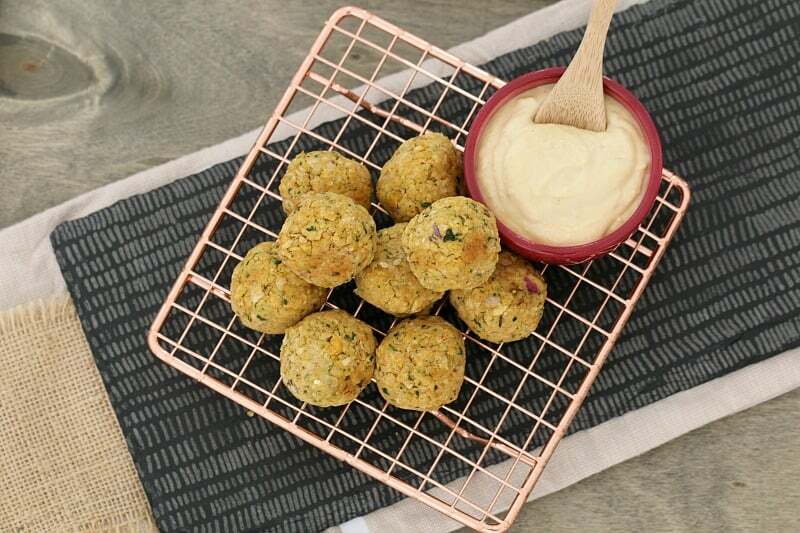 So whether you’re cooking up a batch of falafel balls for yourself or for your whole family, this oven baked version is sure to be a hit with even the fussiest of eaters! 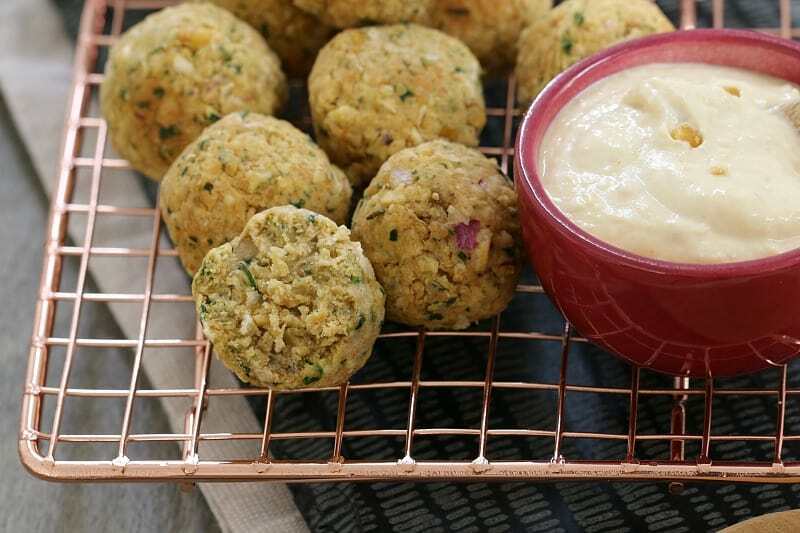 Deliciously healthy oven baked falafel balls made from chickpeas & baked to crispy perfection. Serve with hummus and tabbouleh for a nutritious family meal! Preheat oven to 190 degrees celsius (fan-forced) and line a baking tray with greaseproof baking paper. Place all of the ingredients into a food processor and mix together well. If there are any large chunks, mash them with a fork (you still want the mixture to be a little lumpy though). Roll tablespoonfuls of the mixture into balls and place on the tray. Lightly spray with olive oil cooking spray. Take the tray out of the oven, turn the balls over and bake for another 15 minutes or until golden and crispy. Serve with tabbouleh and hummus. 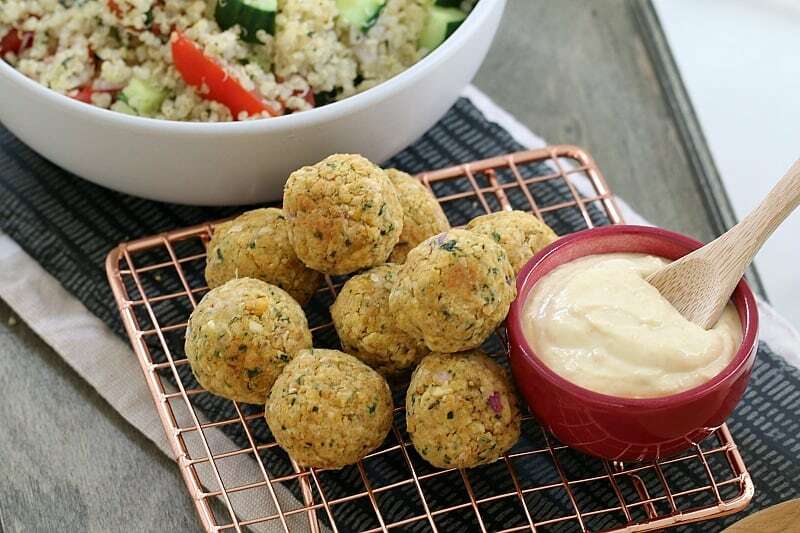 Deliciously healthy oven baked Thermomix falafel balls made from chickpeas & baked to crispy perfection. Serve with hummus and tabbouleh for a nutritious family meal! Place the red onion into the Thermomix bowl. Chop by slowly increasing to Speed 4. Scrape down the bowl and repeat until finely chopped. Add all of the remaining ingredients to the Thermomix bowl. Mix by pressing Turbo 5-10 times or until the mixture has combined (it's fine for the mixture to still be a little chunky). Roll tablespoonfuls of the mixture into balls and place on the prepared tray. Oh yum! Felafel is my favourite and I love that it’s baked and not fried. YUM! 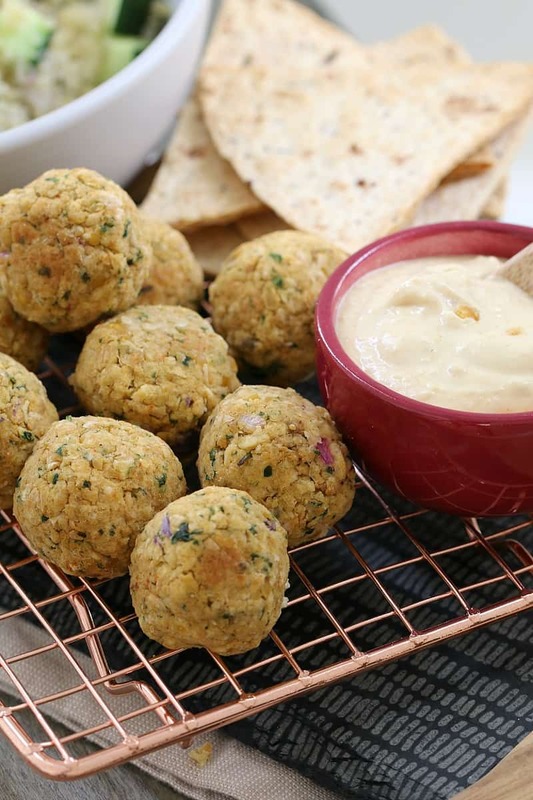 I love falafels but have never tried baking them before – will definitely be making these! I was just wondering how many calories are in each falafel?